Kids, I hope you can look back on a day and can say it was the best day of your life, even if that day changes throughout the years. Maybe right now the best day of your life was the day you were able to try real ice cream (Arianna) or the day you were able to wear Thomas unders 24/7 (Evan). But for me, that day would be yesterday, May 5, 2013. It sounds cruel, as a mother and a wife, a college and grad-school graduate to say that a random Sunday in May could surpass your births, our wedding day, the days I graduated, or even the days I got my first job…or started at my current company (which, by the way, I totally forgot my 4 year anniversary was last week, I was so wrapped up in this day). I know it sounds awful, but I hope one day you will understand. One day, you’ll look at what your Mama did and know that this day was a big one for her. Your Mama carried a lot of weight, both physical and emotional over the past 6 years. I went through some things I never want you to go through, and I needed to find a way to deal with that and move on. 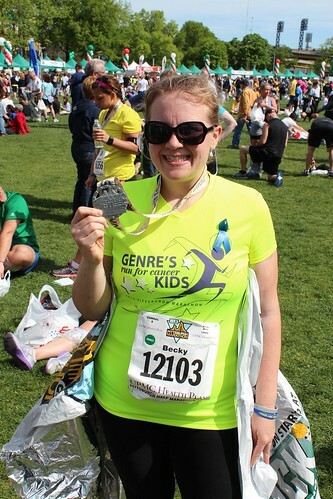 I found my healing in running, and set a goal to run a Half Marathon. Saturday I was a complete mess, laughing, crying, snapping, doing everything wrong, doing everything right. My emotions were crazy, I was scared. My goal was just around the corner. 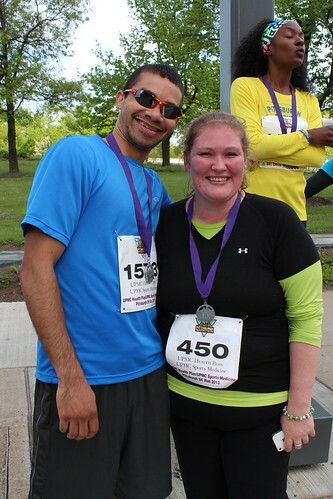 Greg and I went downtown on Saturday and he ran the 5k with my friend Steffani. They did awesome, it was her first 5k and I was so proud to watch it. 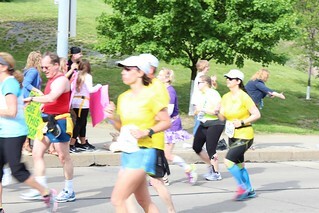 Then we went to the Expo and met a pacer who gave me a temporary tattoo to wear and a goal of 3 hours. (When I left my office on Friday, the goal was 3:30 and not to get swept.) I was pumped, I could do this. We went to lunch. We shopped for too long. I was exhausted and a wreck. Sleep came way too easily, albeit after eating my first entire Subway footlong in 2 years (shame? none.). Sunday morning, the big day arrived. You were not with me, I decided it best in case something crazy happened. Instead, you watched the TV from Grammie and Pappy’s for me. (Arianna, you claim you saw me, but no one can confirm as you were alone at the time.) We headed downtown, my arms and legs branded in motivations. I was ready, but I didn’t know it. Greg held me for what seemed like forever after we exited the T in a mass of participants. I didn’t know if I’d see him again (my emotions went that crazy) and I wanted to enjoy every last second. He took a picture of me, we stretched my hamstrings, we hugged goodbye and he wished me luck. I was thrown into a sea of E-Corral pacers. The National Anthem played. I bawled. I saw a voicemail from Myrtle Beach friends–I got to listen quickly before the start, it was ‘lil runners wishing me good luck. I cried, I laughed. -Greg and I saw a shooting star above the city just before the race–a sign that for me has always been Wendy letting me know she’s still here, looking out for me. -They played Renegade just before my start. -They played Don’t Stop Believin’ as I crossed the starting line. 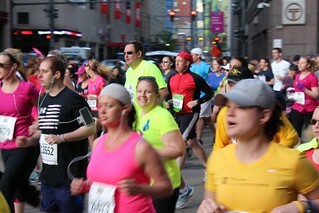 -A blogger friend was live blogging from the crowd–I saw her, but didn’t realize it until the race was over. 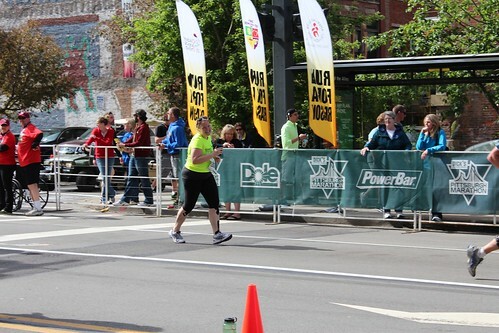 -Really fast, for me, but felt good. Around 12 minutes. -Why are people already lined up for the bathroom? I swear to my self I will not stop. -Wow, here already? Another fast one, 2 miles down in just over 24 minutes. -Didn’t grab a water, hope the next one is before mile 6. Gatorade cups are slippery! -The clock is broken. My time is going to be incredible if I keep this up. One bridge down. -Where the hell is the clock? -Where the hell is Greg? I’ve crossed two bridges, he better be on the third one. -So glad I saw Greg on the bridge. He looked so cute sitting up there, cheering for me. -Oh, already at Mile 5? Where was mile 4??? -Greg and Steffani got to run down that hill yesterday, lucky ducks. -Almost halfway. I’ve got this in the bag. If I keep this pace up…wait…I’ll be under three hours. There’s no way. No way. -Will I ever get to Mile 7? 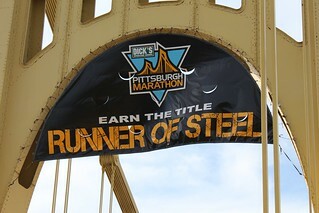 West End bridge and the hill after were tough, but tougher is ahead. Keep your head up, keep swimming. -West End neighbors are awesome! -Wait. Where was mile 7 (again, never saw it). -Furiously looking for Greg. He finds me, I realize even at fluid stations I didn’t walk, just ran through to get my water. I yell, NO WALKING I AM A BEAST! He jumps to the side of the course to reach out to me, I never have felt more love. -GU is an amazing invention, can I have more??? -I have never full out run this far. -Time to say goodbye to the marathoners and make the Birmingham Bridge mine. I got this. -That hill is a mother, forget the bridge. -If I pass out on this hill, no one will be able to get me…oh crap. Keep going, don’t walk. -They said it was all downhill from 12. What is that hump before the finish line? -Finish line in sight. Find husband, make sure he’s watching. -Cry. Cry. Cry. This is so awesome. -3:13. I did it in just over 3 hours. OMG. Wait. That’s the gun time. I started 20:50 after that. OMG. I did it in under 3 hours. I can’t do math right now. -My knees won’t stop moving. Ouch. -I need a picture. I need a heat wrap. I need the glory. -I need water, lots of water. No medic needed, I am walking!!! -Find Greg or bathroom? Bathroom wins. Greg finds me first. He had to hold me so I wouldn’t fall over. -How the hell can I pee if I can’t bend my knees anymore? -OMG. There’s a medal around my neck. I finished. No cart sweep. Cry, cry, cry. -My phone is dead. I can’t share this with anyone but Greg, but that’s okay right now. -I need to stretch. Don’t let anyone step on my head. -Results tent. “Did you have a goal for under 3? Cause, uh, you killed that.” 2:52:55? ARE YOU SURE THAT’s ME??? “Yes, that’s you!” OMG. Sunday was an amazing day for me. It marked leaving things on the pavement, fighting off fears, meeting goals, remembering what got me to here and where I can go now. It was an amazing experience, and I am so proud to say I did it. I am a fighter, and I won’t give up. 5/5/13, the best day of my life (so far). 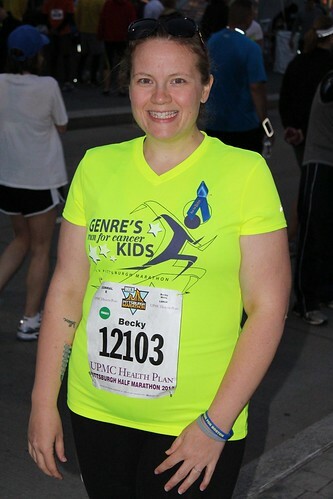 This entry was posted in Becky, Pittsburgh Fun, Pittsburgh Marathon, Weekends and tagged Half marathon, Running. Bookmark the permalink. Great post. 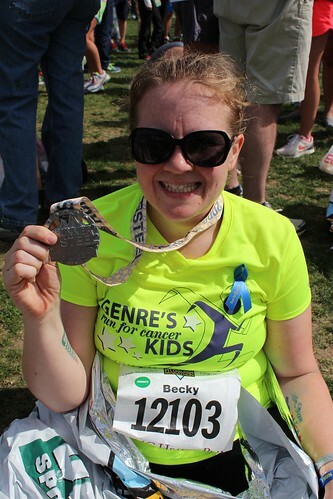 Really inspired me to try a half-marathon hopefully next year. 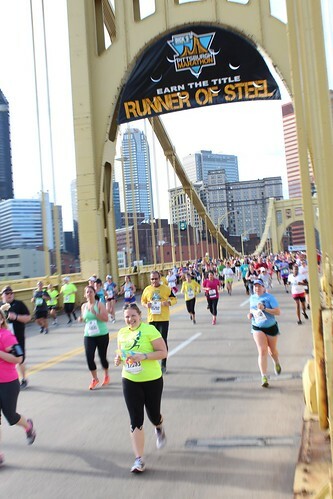 My old friend from high school ran Sunday in his 7th marathon, he says Pittsburgh is his favorite in 5000 ways… community, scenery, energy. Congratulations on a great time! Definitely a good one to do. Thank you! FANTASTIC! A job well done! Congratulations! You should be so proud of yourself!